With UK annuities lower by up to 24.0% over the last year people retiring are looking at other options from flexi-access drawdown to fixed term plan to delay buying an annuity until rates recover. Since September 2015 rates for UK annuities have reduced 24.0% for those aged 60 buying a 3% escalating, single life income. Annuity rates reduced earlier in the year after new Solvency 2 rules were introduced requiring insurance companies to meet more stringent capital adequacy requirements. 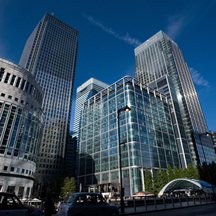 This was followed by the European Central Bank (ECB) announced the start of their Quantitative Easing with €1.1 trillion. 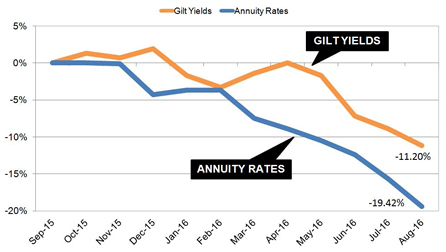 The Brexit vote sent 15-year gilt yields to all time lows followed by reducing annuities. In August the Bank of England started measures to stimulate the UK economy with quantitative easing (QE) buying £60 billion of UK government gilts and £10 billion of corporate bonds. Almost half of all annuities have reduced by more than 20% over the year for people aged 55 to 65 buying single and joint lifetime incomes on a standard health or smoker and enhanced annuity. The above table shows how both yields and annuities have declined during the last year. The annuity is based on our benchmark for a 65 year old, single life, level income which is lower by 19.4% and 15-year gilt yields lower by 11.2%. For those aged 70 to 75 rates have not reduced as much and the range is from 12.0% for a 75 year old smoker, 100% joint life, level annuity up to a fall of 19.8% for a 70 year old single life, level rate. For our benchmark a person aged 65 years old with a fund of £100,000 buying a lifetime annuity on a single life, level basis was £5,828 pa in September 2015 and this has reduced by £1,132 pa to £4,696 pa a year later. Over the lifetime of the annuitant based on the Office of National Statistics (ONS) we would expect a male to live for 17.3 years. This would mean he will have £19,583 less over his lifetime and for a female she can expected to live for 20.4 years decreasing her income by £23,092. The latest falls in annuity rates is due Brexit uncertainty with investors seeking safe havens such as UK government gilts and bonds coupled with the action of the Bank of England to boost the economy. The 15-year gilt yields and annuity rates would recover in time once the future of the UK is more certain. By delaying buying an annuity now you can give annuities the opportunity to recover although it may take up to five years. For some delaying to buy an annuity may be possible although if you would like to access your tax free lump sum or need to take an income, flexi-access drawdown or a fixed term annuity could work. For a low risk investor you can consider a fixed term annuity allowing you to select an income and term for the plan. A five year plan would allow you to vary the income you take from nil up to the initial amount selected. Any income not taken accumulates in your account until it is needed without the deduction of tax.